A snow plow attachment will NOT damage your forklift. 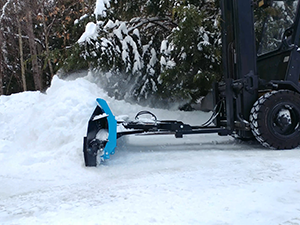 We’ve heard a number of forklift experts having zero experience with a forklift snow plow attachment, tell customers they’ll damage their forklift plowing snow. Forklifts are built extremely rugged and are able to drive uphill while carrying an entire automobile. Plowing two ft of the heaviest snow (weighing 15 lbs per cubic ft) weighs less than 500 lbs as the snow rolls off the blade. Driving a fork truck, not loaded, uphill puts more stress on a machine than plowing the heaviest snow on level ground. A “Serious” Snow Plowing Machine! The reason you’ve never seen a plow on a forklift? No one ever built one that works, at least not the way you would like. Our first plow was a 1 foot tall and 5 foot wide, fixed straight blade. It wasn’t very efficient. It needed to be bigger, and it needed to angle. So we built a larger manual angle, but spent too much time angling VS time plowing. Today, as you’ve just witnessed, we cracked the code with our “Power Angle” model. When it works the way you want, you don’t mind plowing! We do offer a manual model, that can be angled from the cab. We offer it for those that don’t have a side-shift or other hydraulic port on their machine. We used that model here in our yard for one full season as well as on and off testing over many years. It’s the same as our “Power Angle” model, just without the hydraulics. But Seriously, if you have a sideshift or some other hyd port on your lift, you’ll want the “Power Angle” option. 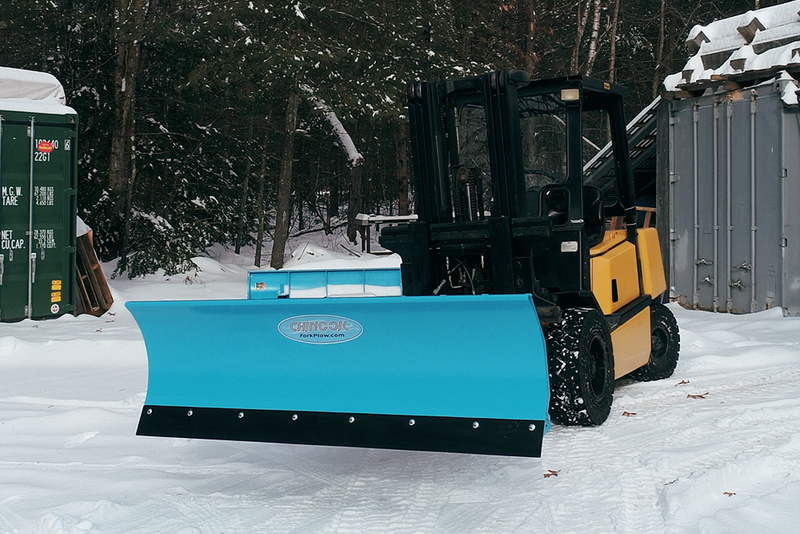 Plows come fully assembled allowing you to plow the moment it arrives. Hooking up the hydraulics is simple and we’ll be right here to show you how! 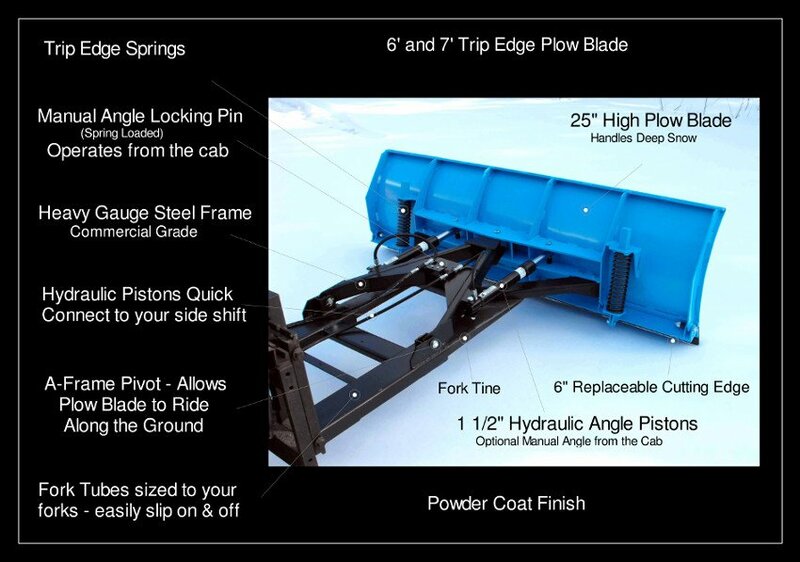 We designed the plow to be rugged and cost effective to manufacture, allowing us to offer it to you at a fair price. If you don’t love it, we’ll take it back. Simple as that! 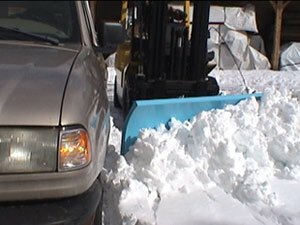 Solve Your Snow Removal Headaches! Why don’t you see snowplows on forklifts? 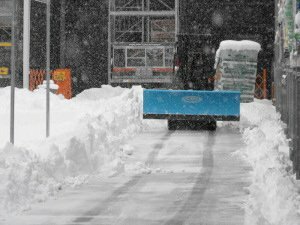 Why can’t a regular fork truck be driven in the snow? What size should the plow blade be? Should it angle? How do you simply operate it from the cab? 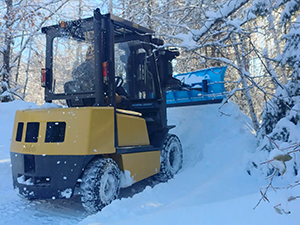 What’s crazy is, when you factor in the agility of a fork truck, it’s quite likely the most versatile Snow Removal Machine out there!